I love this fruit. Tasted it at Fruit and Spice a few years ago and its very refreshing and unique; tastes like a slightly sour peach (and looks and feels like a small peach as well) for those not familiar with it. I received a bunch of seeds from Ebay and they are all sprouting rather quickly. But these typically need a male and female plant to set decent amounts of fruit. I have multiple sprouts in single pots and I don't want to dig them out and separate them. Is this a good strategy to possible bundle males and females together is this going to be a problem in the future? 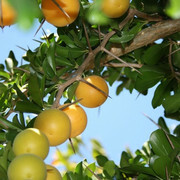 Re: Anybody Growing Dovyalis Caffra (Kei Apple) ??? I have one that I grew from seed in a three gallon pot... my plan is to graft on a male branch if it turns out to be female, or vice-versa if male. Keeping the majority of it female as it grows. I did this on a carob tree and it worked out great. I've eaten some but the thing that struck me about the flavor wasn't just the sourness but some underlying off-putting flavors (bitterness and other things I can't describe). So it wasn't sour in an appetizing way. Maybe there's just a lot of variability in quality and flavor? I've been thinking about planting a hedge of these as a coyote fence -- any idea if that will actually stop coyotes? Supposedly, they were planted around African villages to keep out lions... if that is true, I guess it would work with coyotes? Are they fast growers? How old is the one in your photo? I believe it’s been about two years from seed. It should grow faster this season now that it has some size to it. My first taste of Kei at Exotica in Vista, CA was a surprise. Refreshing sweet/acid with a touch of something almost vegetable. Cucumber? I'm not great with describing flavors. I loved it. Immediately bought his female 'Silber' and a male. They've been in the ground for many years now and I just got a few flowers. Makes me a bit suspicious about their clonality. The botanic gardens also has several trees and one of them with fruit about as good as the Silber I tried. Only tasted once though. It air-layers readily and I have 3 airlayered plants of the Silber. I have a couple Silber seedlings and a dozen of the SDBG seedlings. Just planted a hedge out actually with a mix of all 3.
the seeds sprout readily and are very tough. Growth in a pot has been slow for me. I hope Dave Silber has a good selection...I have two older females and one male. Both types are large shrubs. I agree with Barath about the flavor. Lots of fruit on the ground now, but even the local wildlife leaves them alone. I don't think it would even "make good jam". The good news is that we have not had a lion attack and they seem to stay away. The thorns are effective for cleaning drip orifices.